New Zealand is made up of two main islands and a number of smaller islands and has a mild and temperate maritime climate with mean annual temperatures ranging from 10 °C (50 °F) in the south. The South Island is the largest Island of New Zealand, and is divided along its length by the Southern Alps. Fiordland’s steep mountains and deep fiords record the extensive ice age glaciation of this south-western corner of the South Island. 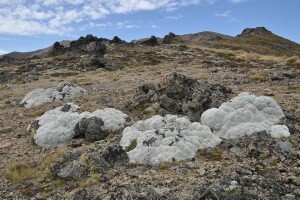 New Zealand’s geographic isolation for 80 million years and island biogeography is responsible for the country’s unique species of animals, fungi and plants. 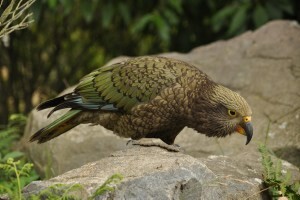 Most notable are the large number of unique bird species, many of which became extinct after the arrival of humans and introduced mammals. 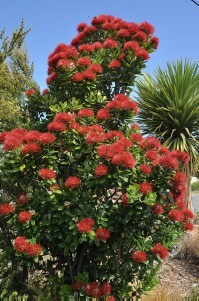 About 82 percent of New Zealand’s indigenous vascular plants are endemic. 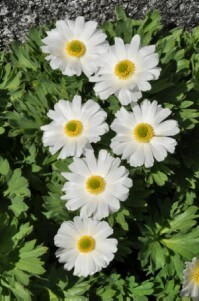 The flower colours are not very exciting and mostly white, sometimes yellow and rarely blue. 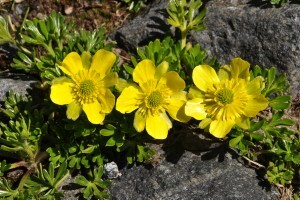 In the mountains you can find very special alpine plants like the vegetable sheep. These plants, Roaulia eximia and Haastia pulvinaris can be very old. 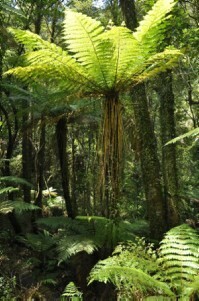 Some plants are estimated to be several hundreds of years old. 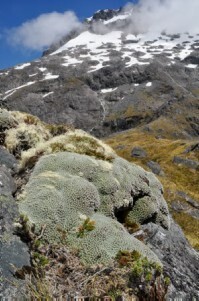 Mountains dominate large areas of the New Zealand landscape. About 60% of the South Island is covered by ranges with peaks over 1500 metres high. The highest peak in New Zealand is Aoraki/Mt Cook, at 3754m on The South Island. Lake Putaki very close to it has a milky-turquoise colour. The Southern Alps stretch for 500 kilometres, from Nelson Lakes National Park in the north-east to near the entrance of Milford Sound in the south-west. Made of greywacke sandstone in the east and schist in the west. All of New Zealand’s peaks over 3,000 metres are in the Southern Alps. For thousands of kilometres, the Southern Alps are the only significant mountain barrier to the moist westerly winds of the Southern Ocean. 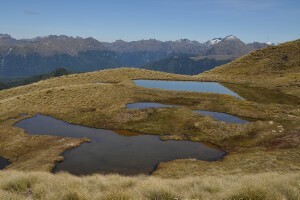 This causes the range to generate the most extreme climatic conditions in New Zealand. There is a very high-rainfall zone to the west, and often drought-prone regions to the east. Te Anau is the gateway to the world-famous Fiordland National Park, a World Heritage Area covering nearly 1.2 million hectares. Fiordland comprises the rugged, glaciated country and fiords in the south-west corner of the South Island. If you were to imagine the most dramatic landscape on the planet, it might look like this. Fiordland represents nature on a grand scale, where waterfalls tumble hundreds of metres into pristine, forested valleys, and glacier-carved fiords indent its coastal boundaries. The road to Milford Sound, which traverses Fiordland National Park below massive peaks and bluffs, is considered one of the finest alpine drives in the world. Arriving at Milford, visitors are confronted by the most famous of New Zealand icons – the majestic Mitre Peak. 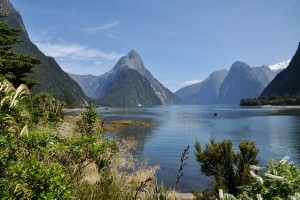 Milford Sound is the most famous, but Doubtful Sound – the deepest – is also easily accessible. Visitors to this vast, remote area, practically untouched by humans, are often overwhelmed by the incredible solitude and serenity of Fiordland. 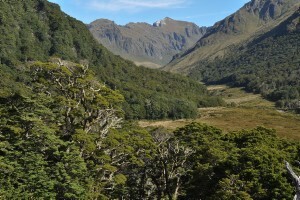 One of the best plant walks, but also one of the toughest in Fiordland, is the Gertrude Saddle walk. 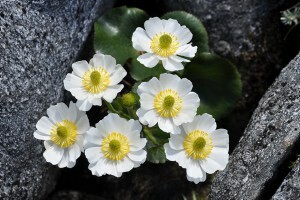 It will take you a full day, but you will be rewarded with a cream of special alpines as Ranunculus sericophyllus, Raoulia buchananii, Hectorella caespitose, Celmisia hectori, Haastia sinclairii, Ourisia caespitosa and many more. It is open to all public, but make sure you are fit enough! Lake Tekapo is about 3 hours drive south-west of Christchurch in the Mackenzie Basin. The township faces north across the remarkable turquoise coloured lake to the mountainous drama of the Southern Alps. Lake Tekapo gets its intense milky-turquoise colour from the fine rock-flour (ground by glaciers) which is suspended in the water. Near Lake Tekapo are some very nice mountains to look for alpines. Mt. Edward and Mt. Dobson have a good variation on plants, but both areas are privatly owned at not open to everyone! Mt. Dobson has a special plant, Acyphylla dobsonii with very spiny leaves. 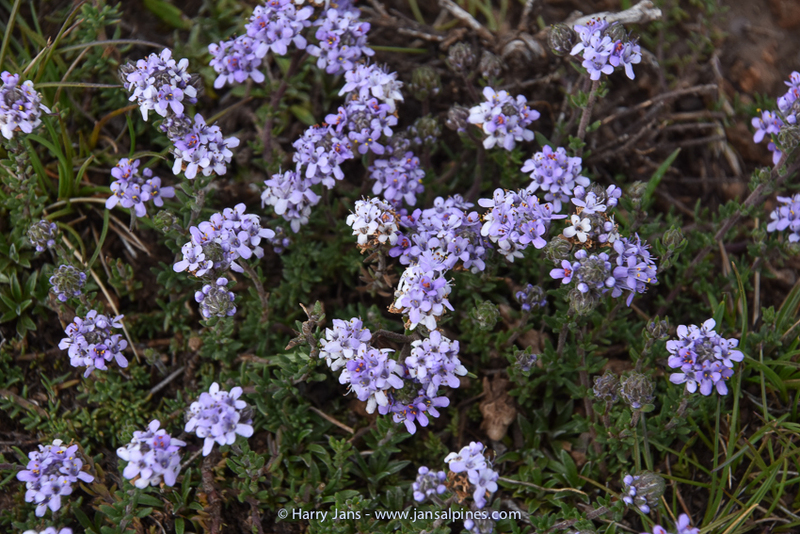 Other plants here are Phyllachne colensoi, Anisotome aromatica, Euphrasia integrifolia and Chionohebe pulvinaris. On Mt. 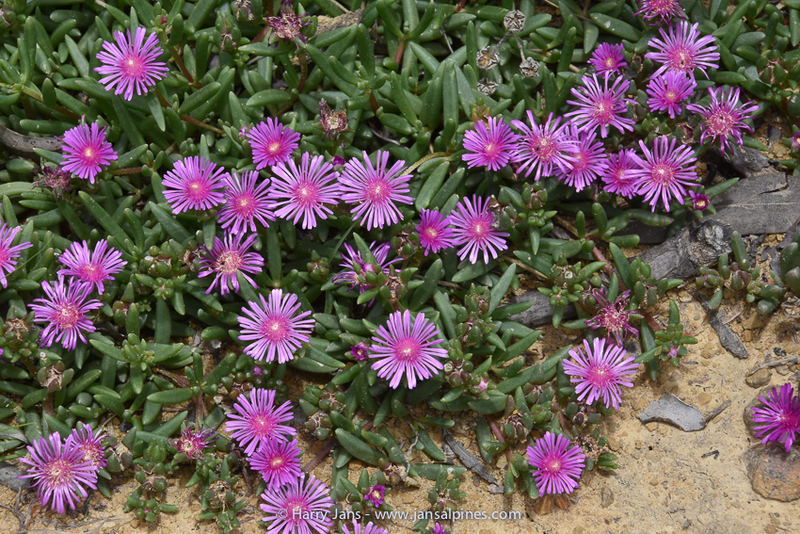 Edward you are able to find very nice speciemens of Raoulia eximia, Gentianella corymbifera ssp. corymbifera and Pimelea traversii. 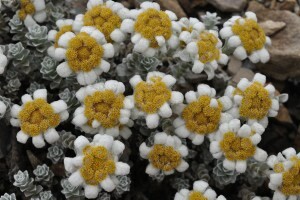 If you are interested to see special endemic alpine plants keep in mind that many ski field areas, where you can see the best alpines, are privately owned. Very often a locked gate at the base of the pass will stop you. 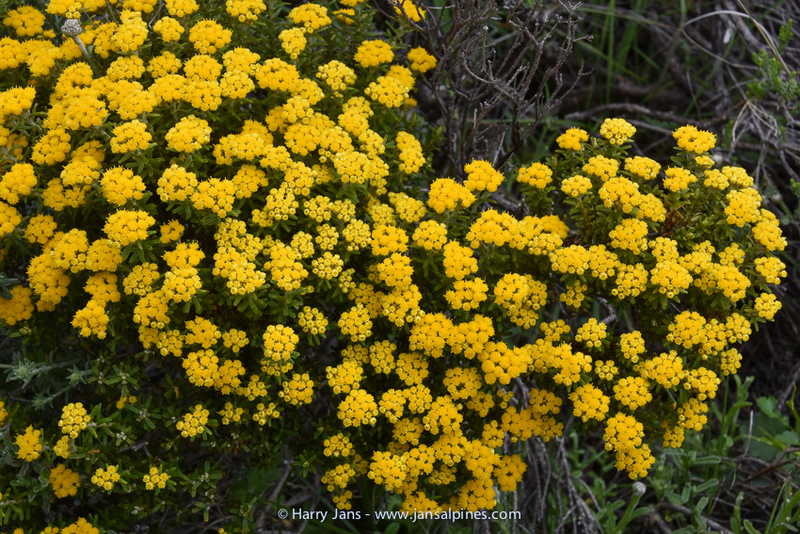 If you do not have good contacts with local people it will not be possible to drive all the way to the top of some mountain passes and it will take you many hours before you reach (on foot) the alpine zone with its plants. 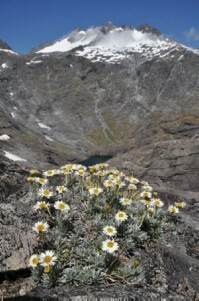 If you are interested in a good book with most of the New Zealand alpines I can highly recommend “Above the Treeline”, nature guide to alpine New Zealand by Alan F. Mark (2013) This field guide sized book covers both the flora and fauna to be found in New Zealand’s mountainous regions. 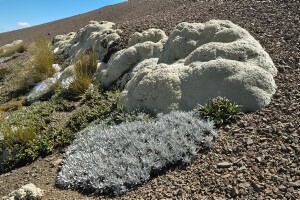 As well as the unique flowering alpine plants, which constitute the majority of the book, it includes ferns and fern allies, conifers, lichens, mosses and fungi; birds; frogs, geckos and skinks; butterflies, moths, grasshoppers, beetles and other invertebrates. The informative introduction is followed by descriptions of more than 850 species illustrated by approximately 1150 photos. 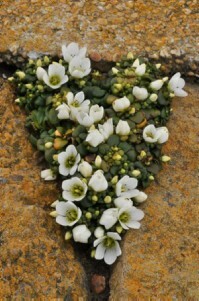 If you are really interested in NZ alpines you might consider to join this Society. 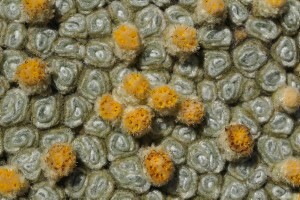 Next to a bulletin they have an impressive seed list with many endemic NZ alpines.